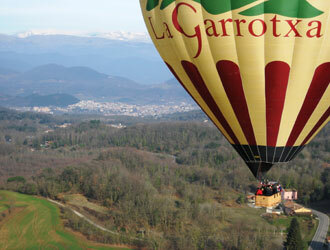 Company offering hot air balloon rides to the La Garrotxa area. The routes taken run through the heart of the Volcanic Zone Natural Park, between the Croscat volcano and the Santa Margarida volcano and the beech woods of La Fageda d`en Jordà, 5 kilometres from Olot, in the direction of the town of Santa Pau. Adapted basket with door and seating. Adapted vehicle with room for one person. No sign language interpreters or trained staff to assist the blind or the visually impaired. Specifications verified on-site for the Agencia Catalana de Turisme by accessibility consultants. What else does this destination have to offer?